I saw a Martha Stewart video the other day. She was making a chocolate cake and I believed her when she said it was one of the best. But the sugar —- 2 cups! And then 1 1/2 cups of confectionery sugar in the frosting. If I made that cake I would to have lots of folks over to eat it, because it would be too tempting to keep in the house. Bill and I would want to eat the entire cake. Both of us have a craving for something “sweet” each and every day. But reaping a lot of health problems from great amounts of sugar (which seem to be prevalent in most American diets) was something we didn’t want. So we found a way to deal with the craving for sweets many years ago. The best way we’ve found involves fruit of some kind. When apples are in season, we enjoy fruit salads. Apples, pineapple, raisins, nuts tossed with a teaspoon or so of olive oil mayonnaise. Very satisfying. 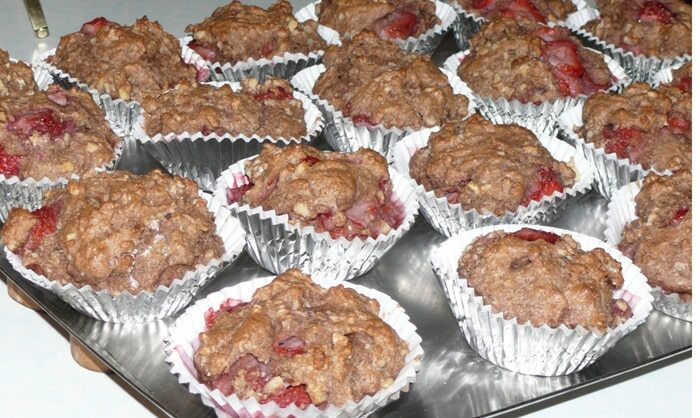 Strawberry muffins are delicious made with fresh berries or my own frozen berries. Strawberries, raspberries and blueberries come out of my garden and I freeze a lot for winter use. Apples come from Golden Acres Orchard in season. Organic dried apricots I order on line and only use when I’m out of everything else. Because our fruits have no poisons on them, they not only satisfy the craving but benefit nutritionally as well. These little blueberry pies (or tarts) only have 3/4 to 1 cup of blueberries. This is our favorite sweet. Yummmm! No sweetener is needed for apricot pie. Nor do I use any sweetener in the apple pies. We enjoy the tart/sweetness of our York apples. I make my crust up, make the daily pie, and keep the remaining crust wrapped in plastic wrap in the frig for the next pies. Keeps beautifully for at least 3 days and sometimes longer. The only one that takes a bit more doing than a regular pie is the small apple pie. 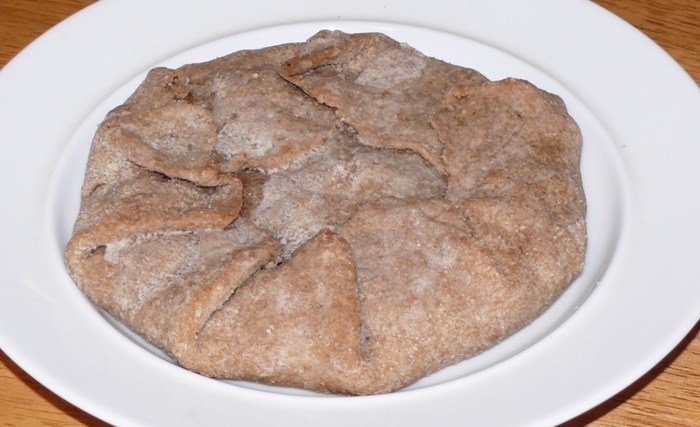 A regular pie with a “whole” crust cooks for about 50 minutes. The crust is thick enough to take cooking that long and comes out perfectly. adding a bit of lemon juice, a tablespoon of water, and cinnamon to 3 apples peeled and cut into pieces. Cook in a saucepan on top the stove until very soft. Some apples should break apart when you stir. Stir to break down some of the apples. Put the pie together and bake at 400 degrees for 30 to 35 minutes. Hopefully, how we have solved our sweet tooth problem will give you some ideas of how to solve yours if you have one. Want to Cut Out Sugar? If you want to cut out sugar, try continually decreasing the amount you use by one tablespoon over a period of time. Sugar (like salt) is an acquired taste, so you can acquire a taste for less sugar as well. After a period of time, you might find that you are enjoying the taste of the food like you use to enjoy the sweetness. It works for me in the Strawberry Muffins —- but even then I have to be careful. If I get just a sprinkle too much – the muffins will have a slight bitterness that is distinctly Stevia. 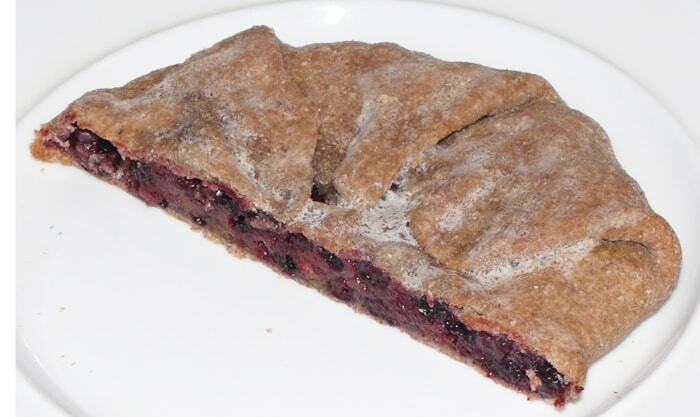 I’ve also tried it in the blueberry pies without success. I added only 1/4 tsp and by our taste — it ruined the pie. That distinctive Stevia taste was still there. If you don’t have your own strawberries, blueberries, and raspberries consider growing some. They’re easy and very rewarding. i prepared ONE raised bed this past Fall, in preparation for this year. i am starting with one and if that goes well i will add more beds. i have been tossing my kitchen compost on top of the bed since about November. i know i need to cover with straw/pine needles but have not done so yet. will i need to turn the compost into the soil during the winter or just leave it on top? it’s not doing much now with all this cold weather (and no straw), but once i cover with straw/needles, what else should i be doing if anything? thanks for all of your wonderful knowledge! How wonderful and so easy. It is certainly appropriate as I have just finished a ‘no sugar’ challenge with “The Nourishing Gourmet”. I need to go back and read your pie crust post now. Thanks for keeping the posts varied and interesting. I hope you understand the why behind the raised beds. They are not raised just for the sake of being higher than the surrounding soil. They are raised as a result of the process of making the soil loose and adding organic matter. It is good that you have been adding kitchen scraps to your bed since November. Soil life will pull the decaying material into the soil whether you turn it in or not. It will happen more quickly if you turn it in. However, I think I am understanding you to say that your bed is not covered with any mulch at all. If this is the case, there are more concerns here than just whether or not to turn your scraps into the soil. Without any mulch or cover crop on your soil you are wasting a lot of your previous effort. When soil is exposed to the elements – wind, rain, sun, etc. – some very undesirable things take place. 1. It compacts the soil. This is the very reason you dug the bed to begin with was to un-compact the soil and loosen deep layers. 2. Any organic matter than may have been in the soil is burned away when exposed to the elements. Oxygen burns it up. You’ve lost a good bit of time already, and I would suggest getting the bed covered with a deep layer of mulch as quickly as possible. Remember that your soil is a living thing. It is THE most important thing to your success. You must protect and nourish it to be successful in what you are trying to do. At your convenience you may want to go to Browse by Category and review all the posts under Mulch and under Soil Improvement. If you have any more questions on this, please feel free to email me at theresa@tendingmygarden.com. Yes, it is easy Beppy and I am so glad this comes at such an appropriate time for you. I know you have some great fruit planned for this growing season so I know it will be even easier to stay away from sugar once you get that fruit coming in. I especially appreciated your thanks “for keeping the posts varied and interesting.” I was just talking to Bill about that. I want to write meaningful articles, but at the same time I want to entertain and make it fun as well. Unfortunately, if we dwell too much on what is going on in the world, it can be hard to keep our minds focused on what we need to do to make ourselves better. So your thanks meant a lot to me. Helps me to know I’m accomplishing a balance. I was given a large amount of zucchini & my husband has requested zucchini bread. The recipe I’ve been using is Paula Deen’s & calls for 3 cups of sugar. Could I use less sugar? Maybe substitute some honey for the sugar? How much honey? How much sugar can I delete & still have a good tasting bread? I’m glad you want to decrease your sugar use, Betty. I stopped using sugar more than 35 years ago — and I’m still able to prepare lots of wonderful tasting dishes for Bill and me and any guests we might have. Sugar and salt are both acquired tastes so at this point in time what you would consider a good tasting bread might be different than what I would consider a good tasting bread. You’ll need to do some experimenting as you go along and see what works for you. If you google “zucchini bread recipes without sugar” — that’s a start. You might want to go with something like this since you are just starting to cut back on sugar. I’ve been 35 years or more in the process — so I would not even use the 1 cup of honey. About 1/3 cup of honey is my limited for any recipe. But it takes time to find out what works for you. If you can’t use all the zucchini — dig them into your garden for organic matter or put them in the compost pile. That’s never a waste and a great way to use excess that can’t be eaten.